Quotes from the Buddha are everywhere: on Facebook, Instagram, coffee mugs, posters. There's only one problem: the Buddha didn't actually say most of them. 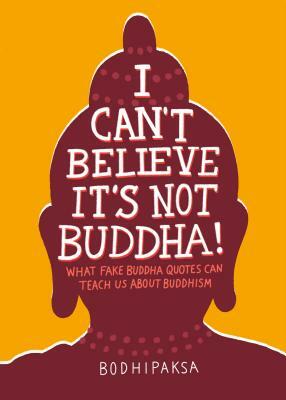 This humorous and informative book takes these fake Buddha quotes as a launching point for a discussion on what the Buddha really did say, and is a great entry point for those interested in learning more about Buddhism--what it is, and what it isn't. Bodhipaksa, a well-known Buddhist teacher and the founder of fakebuddhaquotes.com, takes a look at some of the quotes that are erroneously attributed to the Buddha, explains the ways in which these disagree (or sometimes agree) with Buddhist teachings, and offers some genuine examples of the Buddha's words. The perfect gift for the Buddhist in your life and an essential addition to any Buddhist library, I Can't Believe It's Not Buddha! is at once humorous and scholarly, and a timely antidote to the "fake news" that can surround some of the Buddha's teachings. Bodhipaksa was born in Scotland and currently lives and teaches in New Hampshire. He is a Buddhist teacher and author who has been practicing within the Friends of the Western Buddhist Order since 1982. He has been a member of the Western Buddhist Order since 1993. Bodhipaksa has been examining and sharing fake Buddha quotes since 2003, most recently on the website fakebuddhaquotes.com. He runs the online meditation center Wildmind (www.wildmind.org) to promote awareness of the positive effects of meditation and has a particular interest in teaching meditation in prisons.